Thou art thyself, though not a GMO. If gene editing isn’t on your radar yet, it will be. Tools for gene editing (genome editing) have been around for over a decade, but the new one – “CRISPR-Cas9” — is so much more quick, cheap and powerful that it is sending shock waves throughout the scientific community. It was the “scientific breakthrough of the year” according to Science, and in recent months it has been featured in mainstream media like the New Yorker, NY Times magazine, Salon.com, and in a TED Talk by CRISPR pioneer Jennifer Doudna. With gene editing, science could create self-fertilizing crops! But actually science spent the last 60 years creating increasingly fertilizer-intensive crops. Insecticide- and herbicide-intensive too. And the main use of GMO technology has been to create even more herbicide-intensive crops. Gene editing, especially with CRISPR, is much more precise and controllable than the comparatively clunky process that have been used to make GMO’s (genetically modified organisms), and it obviously has enormous potential. We are already seeing headlines (sounding a lot like corporate press releases) promising that gene editing could banish hunger, cure disease, even make self-fertilizing crops — if only the public keeps its busybody luddite nose out of it and leaves biotech companies free to alter whatever DNA they feel needs altering. legislative fights erupted over GMO food labels. All these issues have impacted public opinion and we are still bickering over them. We don’t know what direction the gene-editing debates will take. But one crucial battle is already being quietly waged over a question that grows directly out of the GMO battles: do we call gene-edited organisms GMO’s? This is key not just for the obvious reason that we need some agreement on terms in order to talk with each other; more importantly, it will shape how the public reacts to the new technology. 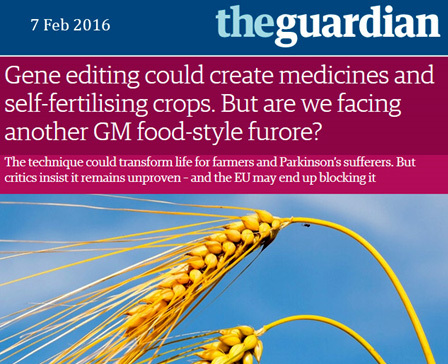 Is Gene Editing Genetic Modification? Whether gene editing is genetic modification obviously depends on how you define your terms, and the terms for this stuff have an interesting history. In 1958, just 5 years after the discovery of the structure of DNA, Nobel laureate Edward Tatum predicted “processes which we might call biological engineering.” When this came along in the early 1970s, it was called “genetic engineering” or “recombinant DNA,” although these terms were mainly used in scientific circles. 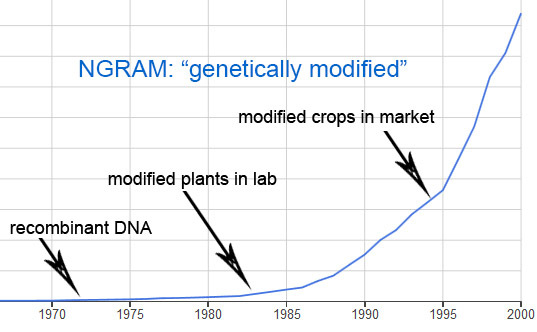 Public awareness of the technology rose in the mid-1990s when it appeared in crops and foods; “genetically modified” then came into common use and “recombinant DNA” declined. Here’s a short explanation of the science. Of the technologies involved in genetic engineering, nothing is as important as a group of enzymes called nucleases. Nucleases exist mainly because a war has been raging between viruses and bacteria for billions of years, and bacteria long ago developed these enzymes to chop up viral DNA. Biotechnologists learned to manipulate these “molecular scissors” to chop DNA so it could be reassembled and inserted it into target organisms. Jennifer Doudna’s figure of DNA sliced by Cas9 and given a piece of donor DNA. See her Ted talk from 2.55-6.35 for more. But most nucleases are hard-wired to chop DNA only at specific sequences. Genome editing uses soft-wired (programmable) nucleases to cut virtually any DNA in any organism at any specific spot. (The beauty of CRISPR-Cas9 is that it is easy to program.) 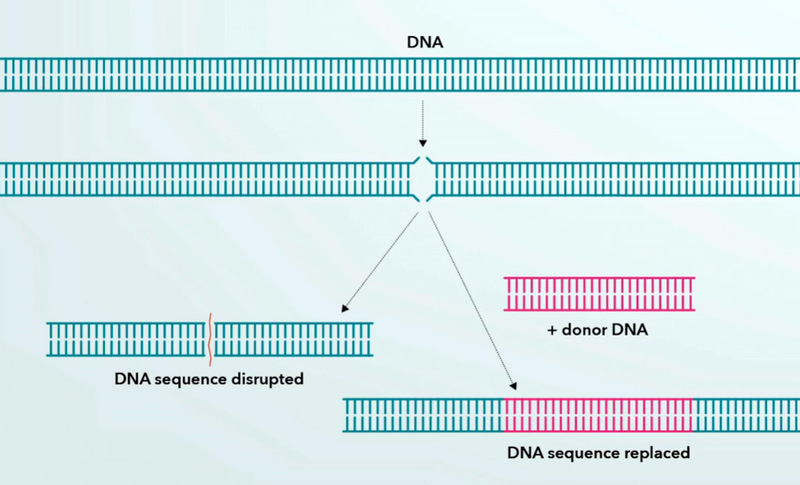 Biotechnologists can then manipulate DNA’s natural repair mechanisms, for instance by adding “donor DNA” that will be patched into the DNA molecule as it self-repairs. So the older recombinant DNA and the newer gene editing both manipulate bacterial nucleases to change the DNA in target organisms. But recombinant DNA introduces significant amounts of foreign DNA (1 or more whole genes) while gene editing introduces small amounts of concocted DNA or none at all. So do you call them by the same name or not? I said it all depends on how you define your terms, which in turn depends on what you are up to. And it looks like a priority of gene editors is, to quote New Yorker’s Michael Specter, to “Avoid the Monsanto Problem”. An alternative view is that GMO’s have engaged people, but people failed to find them useful. After all, the most common GM crop in the world by far is the Roundup-Ready soybean, which yields a little less and takes a lot more Roundup. And safe? Many of us believed that at least Roundup was safer than many other herbicides, until the FAO concluded that it was likely carcinogenic all along. But whatever caused the problem, it is a problem, and gene editors understandably want to put as much distance as they can between their new technology and GMO’s. Which is precisely why a campaign is on over a name. A huge technological pivot is going on in crop breeding. If the end of the 20th century was the era of transgenic breeding or GMO technologies, the 21st century is silently turning to non-transgenic breeding or non-GMO technologies. In contrast, gene editing enables stable and heritable genomic changes quickly and easily without introducing foreign DNA…[whereas] gene editing will enable researchers to modify genetic information in a natural way to bring out of the existing genome entirely new traits. And best of all, regulators have given it the green light to position its products as the non-GMO alternative. This European Biotech site answers their own question with a resounding NO on the grounds that edited crops lack a transgene. Why this should be illustrated by a head of broccoli and a bike is opaque to your humble narrator. 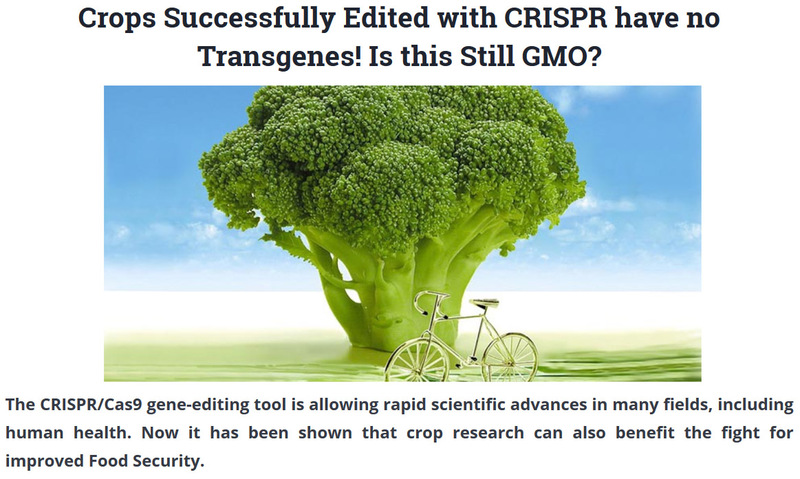 And the European Biotech website answers its own question “Crops Successfully Edited with CRISPR have no Transgenes! Is this Still GMO?” with a resounding NO because gene-edited crops lack transgenes. Got it? Gene editing is not genetic modification because it doesn’t introduce foreign DNA. OK actually it does, but not as much. And that’s what makes all the difference. In fact, unlike GMO’s with the transgenes, this is a natural way to introduce traits. 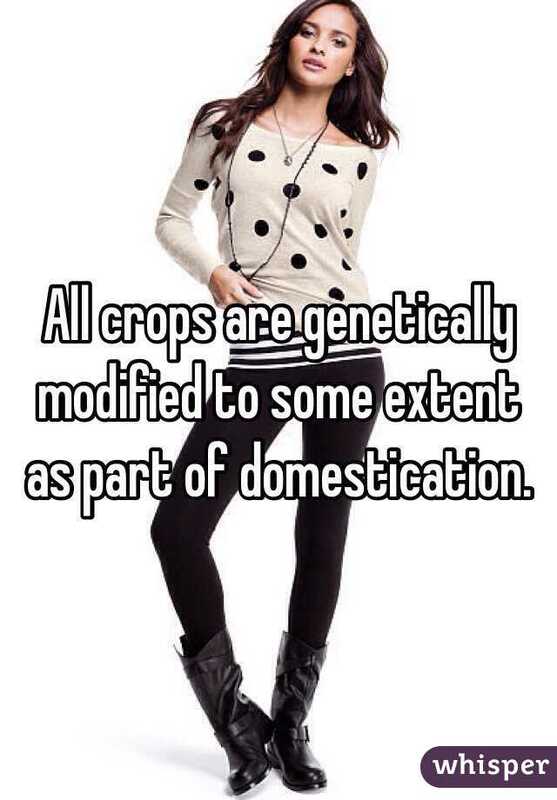 Gene edited crops are not GMO’s. Any questions? I have one. Haven’t biotechnologists been insisting for years that all our food plants are GMO’s? In fact, that any organism affected by humans is genetically engineered? That it makes no difference if foreign DNA is involved or not? You must have run across the meme that “all our food is genetically modified.” Biotechnologists seized on this repackaging of the term to counter GMO opponents who were gaining traction with FrankenFood imagery. It has become nearly ubiquitous. This rather contrived repackaging of the term pushed its way into the pages of Science in a commentary by biotech booster Nina Fedoroff entitled “Prehistoric GM Corn.” Fedoroff was commenting on research on corn domestication that had nothing to do with genetic modification or with her, GMO-splaining that natural mutations were “genetic modifications” and that ancient Mexicans selectively replanting seeds were doing “genetic engineering.” No foreign DNA or bacterial nucleases were involved and in fact no DNA had been altered — domestication doesn’t alter DNA, just frequencies of naturally occurring genes. But her point was that if there are any human-induced changes, even just in gene frequencies, then you’ve got yourself a GMO. If you follow GMO media you see the claim almost every day. From Fedoroff again and again. From Peter Raven. In National Geographic. In the New York Times. In AgBioWorld. In Business Insider. In plant science courses. Journalists have been persuaded that this is a story: “Sorry hipsters, organic kale is genetically modified” explains a Smithsonian headline, taunting a purely imaginary bloc of bearded morons. And as long as you’re claiming that all our food is genetically modified, why not claim that we are too, since we’re eating it? 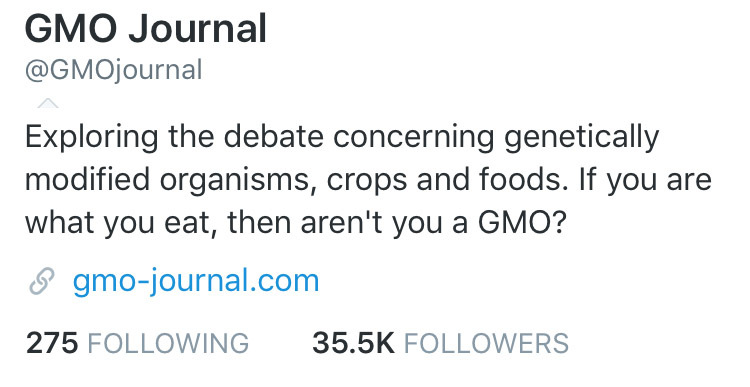 This is exactly what the GMO Journal tweeted today. Got it? All our food, our own bodies, indeed almost everything in life is genetically modified. Everything, that is, except for gene-edited organisms, whose DNA has been cleaved by engineered nucleases and has incorporated donated DNA to alter gene function. That’s just natural. Don’t call them GMO’s or they will not smell as sweet.
. That’s how this controversy was widely understood anyway, although it’s inaccurate. This famous sterile-seed technology was developed by the USDA and patented with the cotton seed company Delta Pine & Land. It caught the attention of activists when Monsanto started to buy Delta in 1998, which is when it acquired the nickname “Terminator.” While the 1998 deal was blocked, Monsanto did later buy Delta although they never commercialized the technology. This is obviously a simple explanation omitting much detail. For instance, these nucleases occur not only in bacteria but in prokaryotes in general, including archaea. Does the US government think gene editing is genetic modification? It’s mum on the question; it doesn’t actually regulate GMO’s as GMO’s, instead regulating GM crops as plant pests if they are made with Agrobacterium and regulating then as pesticides if they contain Bt genes. (If they contain neither, they are totally unregulated even if they are genetically modified.) But countries with GMO-specific regulations are starting to weigh in on the side of NOT calling gene editing a GMO technology. This entry was posted in Agriculture, Biotechnology, CRISPR. Bookmark the permalink. Well put. You are exactly right. I always find it silly when I hear that all crops are “genetically modified” and it sounds even sillier when I hear that CRISPR organisms are not genetically modified. The author can mock all he wants, but the issue underlying whether gene editing is “gmo” is also the failure of those skeptical of agricultural applications of genetic engineering to identify any principle that distinquishes recombinant DNA techniques from other types of genetic manipulations that also “differ from natural crossbreeding”, perhaps departing even more from people’s conception of what is normal and natural ways to breed new crops that nature constrains us to. I have yet to see a good rationale, either in any material compositional, nutritional or other measurable difference in the end product or violation of societal value from recombinant methods, which is what we mean by genetic engineering that justified the distinction. Furthermore, I have yet to see any rationale, and this article disappoints as well, on why recombinant technologies that utilize processes of horizontal transfer that we now know occur in nature should be labelled, regulated, hated, feared and despised but the genetic legacy of product of induced mutation through exposure to radiation and chemicals, splitting and recombining whole chromosomes of distantly related but sexually incompatable species (the way we got Renin wheat varieties which organic growers are able to sell us as organic), embryo rescue, hybridizataion, etc., each of which involves human intervention in laboratory settings at some point and are “radically different” (if were going to be sanctimonious about semantic copouts, lets be consistent and use one from the anti-gmo rhetorical quiver as well) from natural crossbreeding, are not worth disclosing to consumers. I suspect the issue with the author and a lot of the anti-gmo movement is not the methodology, per se, but certain applications of it. I think the issue is largely use of genetic engineering to instill herbicide tolerance, and the fear of one company dominating the technology. Its like saying we have to outlaw vehicles because someone used one to rob a bank, even though there are millions of other uses of vehicles we wouldn’t object to. As new applications come along like the innate potato where the trait is non-browning or blight resistance, that have nothing to do with Monsanto and have nothing to do with herbicide tolerance, it is interesting to watch how commenters go through every contortion to link back to Monsanto and glyphosate tolerance. But here is a technology that has a thousand applications other than herbicide tolerance and one which will democratize genetic improvement, its ease and low cost making it much more difficult, if not impossible, to monopolize and readily accessible to public and philanthropic breeding programs. This article does little more than mock efforts to distinguish gene editing from gmo’s as semantic sidestepping. But again, the author fails to help us by offering any rationale or principle that link them. Excellent piece Glenn. We can rest assured that science “journalism” will dutifully convey whatever Monsanto et al decide is best for us, be it transgenic GMOs or gene-edited GMOs. This is a smart take on the framing of domesticates and GMOs and gene editing. I take your point. But I hope you aren’t aiming to promote fear and distrust of CRISPR, which could be used to do wonderful things in agriculture, medicine, etc. Right and I have nothing against CRISPR per se. In fact as a research tool it is incredible. And there are countless applications that would be highly desirable, and not just the obvious ones relating to genetic diseases. I don’t want to “promote fear and distrust” but I certainly want to promote analytic questions like “Who will control this technology and what are their interests?” After all, as I note in the blog, we could have been using conventional breeding to select for crops needing less fertilizer and pesticide but we bred for the opposite. Recombinant DNA could have been used for all manner of crop improvements but its main use has been for herbicide-intensive industrial crops that are money-makers for a very small number of large firms. We don’t yet know who will control CRISPR (there is a battle royal going on over the patents) and how they will license it. Some universities hold patents that they make available through cheap nonexclusive licenses; others don’t. Don’t forget, Univ. of Utah licensed the BRCA patents to Myriad. Although my take on GMO’s is generally opposite to Dr. Stone’s, I was always open to listen to his interpretation of data, particularly in regard to the effects of BT cotton in India. I am afraid this article will likely end my giving his opinion any serious consideration. Stone certainly promotes fear and distrust as evidenced by the six bullet points of misinformation presented early in the piece. Look at the foolishness in his reply; “we could have been using conventional breeding to select for crops needing less fertilizer and pesticide but we bred for the opposite”. Anyone remotely familiar with plant breeding programs, both public and private, would know how ridiculous that statement is. Resistance to both biotic and abiotic stresses are paramount goals in every crop breeding program. The fact that Stone would make such a claim suggests he knows nothing about plant breeding. As someone who works in wheat, let me inform Stone that there are hundreds of disease resistance genes that are targeted for inclusion in various conventional breeding programs throughout the world. Many of these genes were recovered from other species or genera through wide-cross hybridizations enabled by human intervention and subsequently carry large and unknown fragments of alien species. This is true for many other crops as well. Millions of pounds of reduced insecticide use through utiilization of BT-engineered crops are ignored buy the author. Ringspot virus resistant papaya, late blight resistant potatoes, virus resistant squash are all examples of “manners of crop improvement” that have been achieved through recombinant DNA. Certainly Stone must be aware that chemical mutagenesis through EMS treatments has been used for decades to create the same type of point mutations available through CRISPR albeit with the cost of tens of thousands of unknown mutations throughout the genome. Where is the objection and fear of Clearfield crops? His attempt to reduce logical arguments to semantics is what one would expect from an activist. My take on the author is that he has abandoned rational interpretation of science in favor of ideology. Is this essay meant to inform, add to the debate, or purely as a polemical exercise? It’s pretty hard to tell, given the steady drip-drip of sarcasm and disingenous assertions. Then there’s also referring to “Monsanto develop[ing] the “terminator” technology” with the actual account of events relegated to a footnote. Or mention of the Schmeiser lawsuit without mention of the fact that Schmeiser was using the RR trait, as though what happened in his fields was entirely an accident of the wind. Of course you know the facts perfectly well, but present them in a way that nicely illustrates the demonization that has created the “Monsanto Problem” that the biotechnologists are now trying desperately to avoid. The charitable interpretation of what’s going on is that this is an opportunity to have a new debate about this technology based on the actual facts, rather than on misconceptions and fear mongering tied to the term GMO. People like Vandana Shiva and organizations like GreenPeace have more work to do if their polemics don’t automatically attach to the new technology. If that’s so, why mock the effort to avoid the taint of the term, rather than genuinely engage? Or are you just trying to fan the embers of the old polemical flames to start a fire in the neighboring house? Here’s one question, purely on the merits. One method for rapidly developing new varieties is via forced mutations – e.g., by irradiation or chemical mutagens. This is seen as acceptable by all but the most hard-core naturalists. I can buy organic grapefruit originally bred this way. Or, as Nathanael Johnson pointed out in Grist recently, a wheat variety widely popular among artisanal bakers (some of whom, I imagine, would be horrified at the idea of using a GMO) was developed by just such methods. But CRISPR operates, in effect, as a chemical mutagen. The difference from other chemical methods is, of course, that the mutations are highly specific rather than scattershot. You could put this down to semantics (which is perhaps the point of the entire essay), but are you equally concerned about the older methods? Or is the fact that CRISPR operates with precision rather than at random a reason for greater concern? If so, why? You raise above the issue of control. Is this an issue with all Ag technology (such as patented pesticides), or just with targeted modification of genes? If you read a bit more widely, you might find that the author is not some anti-GMO hack but has written about these issues in detail, showing the complexity that eludes the blindly simplifying narratives that come out of the pro-GMO camp and campaigners like Shiva. For example, the question of yields and toxicity is far more complex than you seem to imagine and a few internet citations are really just the tip of the iceberg. The question of ‘does GM work’ is far too simple – as the blog author has painstakingly shown, GM technologies are really situation specific and have a range of intended and unintended effects (environmental and socio-economic) that can be both positive and negative for different groups of farmers, consumers, corporations, etc. Black and white thinking really isn’t suited to the issue at hand. Considering the vast amount of misinformation and misunderstanding about transgenics, I have a pessimistic perspective on the public being able make any sense of gene editing. How it gets packaged and simplified is going to make a lot of difference. Thank you for pointing attention to how this is already starting to happen. Then we have the name dihydrogen monoxide for water. Let’s not forget memes listing a couple of dozen scary sounding chemical names listing the content of everyday fruit that we consume such as strawberries and apples. The implied reasoning being that everything we consume is chemicals so why disparage preservatives, additives, pesticides, etc. that get into our food. Well researched comprehensive article. Clarified and reinforced what I suspected about changing landscape of bioengineering. That’s like calling HFCS a “natural sweetener”, or ketchup a vegetable, or Vetveeta cheese. GMO is an unfortunate term, much like ‘organic’. I prefer using genetically engineered and “GE traits” in the former case (and resort to appending USDA to organic). There’s a precision implied by the word engineered that is muddled in the word modified. As a skeptical, former anti-GMO activist, I’m annoyed by other self-proclaimed skeptics who use that muddled meaning to further cloud the public understanding. Identity is generally tricky business. If you have a single plant with traits created through a combination of natural selection, artificial selection, mutagenesis, transgenesis, RNAi,, and/or CRISPR/Cas9, why should only one of those traits be used to categorize the whole plant and products derived from it? Especially with very highly refined products like soy oil, HFCS, sugar from glyphosate-resistant beets, etc. this makes very little sense.